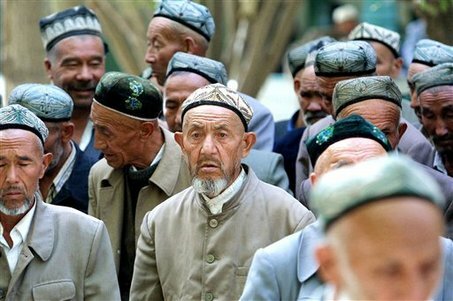 The Communist Party authorities have established a large number of political re-education centers in Xinjiang, detaining people without any judicial process, stripping them of their personal liberty, imprisoning them, and detaining them for indeterminate ‘sentences.’ Estimates of the numbers detained range from hundreds of thousands to over a million, primarily targeting Uighurs, but also Kazakhs, Hui people, and other minorities who follow Islam. Among those detainees are peasants, workers, university, college, high-school and middle-school students, teachers, poets, writers, artists, scholars, the head of a provincial department, bureau chiefs, village chiefs, and even Uighur police officers. Uighurs overseas, as well as their family members and Uighur students who return to China after studying abroad — and even Uighurs who have simply visited abroad for tourism — have been particular targets of attack. Those locked up in detention centers have been forced to sing Red Songs, learn Mandarin Chinese, and study Xi Jinping Thought. Many have been forced to eat pork, drink alcohol, and been force-fed unidentified drugs. Abuse and torture are common in re-education centers, and reports of deaths in custody due to torture have become common. The well-known deaths confirmed to date include Muhammad Salih Hajim, the renowned Uighur scholar of Islam known for translating the Quran with official approval; Halmurat Ghopur, a leading food safety administrator and Communist Party official in Xinjiang; and Ayhan Memet, mother of Dolkun Isa, the chairman of the World Uyghur Congress. Many children, because their parents were disappeared, have been crammed into orphanages and are now suffering terrible conditions. According to official Chinese statistics, over 227,000 Uighurs in Xinjiang were criminally arrested in 2017, 8 times the 27,000 recorded in 2016. In 2017, the number of people detained on criminal charges in Xinjiang was 21% of the total in all of China, while Xinjiang’s population is only 1.5% of the country’s. Further, Chinese Communist Party (CCP) authorities have set up a comprehensive electronic surveillance system trained on the daily lives of Uighurs in Xinjiang. They’ve deployed cameras with facial recognition capabilities, cell phone scanners, a DNA collection system, and a ubiquitous police presence, turning the entire Xinjiang region into the world’s most high-tech Police Garrison. All of the Party’s efforts are directed toward the cultural destruction of the Uighur people, who now face a crisis of survival. We call upon the United Nations to launch an investigation into what is taking place in XUAR and to publicly censure the CCP’s despicable acts. Zhang Qing (张菁), chairwoman of Women’s Rights in China, New York. Ma Yuzhong (马育忠), editor, Xi’an, China. Fu Sheng (付升), scientist, Xi’an, China.